Excellent facial expression. Very realistic. Gross a little but mostly cute x3 my cat recently had three kittens and we have them all away and this reminds me of them. You destroyed my childhood, but this is awesome. They look much less pichu-y than normal: bear with me. Oops. But they are technically Pichu according to pikachu's evolutionary tree. Glad to see my argument won you over. 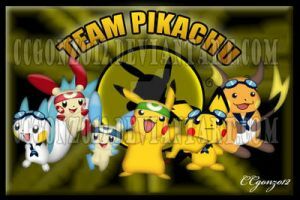 awww cute but wont it be raichu having the babies not pikcachu? Its so funny how you rarely see Pokemon bare offspring, let alone a mammel Pokemon! This is an old pic by now but it's still one of my favorite 'realistic' Pokémon pics. Quitew frankly... the 'egg' thing is a cop-out. Always has been. There are even contradictions in canon, such as references to Pokémon giving birth. It's like the 'genderless' point for Legendaries or other Pokémon who have confirmed genders and even offsprings. It's merely mechanics and cop-outs that in-universe make no sense. This point get especially ridiculous when later gens confirm that 'Pokémon' is the catch-all term for creatures that live in the Pokémon World setting... including the humans of the setting. And last I knew, there are no mentions of humans in the Pokémon setting coming from eggs. I do not doubt that there are Pokémon who lay eggs... but it is ludicrous to think that every species is born from them. It is a cop-out and little more. An excuse to avoid raising incomfortable questions for the kids playing the games and watching the anime. This is so cute, excellent job. I love the way you did this in a more realistic style, you pulled it off well. I think in canon they went a little overboard with the eggs. I can't imagine an onyx or a graveler hatching an egg, for example. I never goy how EVERY pokemon has eggs. Just imagine a Bear (Ursaring) laying an egg. .................. creepy huh? I know it's so cute!!! reminds me of this, [link] It looks a little like Chimecho just gave birth and james is holding the new baby chingling. But, James had that fantasy when holding a Chingling in the bells are singing. And Chingling (you probably know this) is Chimecho's baby form. And James appearetly treats Chimecho just as if he were her birth dad. And I think James was imagining the future. She maybe died (remember in sweet baby james Chimecho got sick). She probably got soo sick to the point she died because, James never came back to retrieve her. [link] if you saw the episode you'll probably remember this. James is all like "I'll ****kin' get ya for that". That episode had some scenes very similar to pikachu's goodbye. James cried twice in the episode. How cute! I'm seriously not sure if Pichu are that small, but still adorable! Well, eggs have been known to contain multiples. That and there are egg-laying mammals. So a mama pikachu nursing a whole litter isn't entirely out of the realm of possibility.